WE ALL love it when we're in the zone - when the stroke is effortless, instinctive and always on the money. But the zone is usually a temporary residence, and it's easy for your stroke to get out of whack for any one of a thousand reasons - if not all 1,000 reasons. Sometimes you have to take your distressed stroke to the practice room and break it down step by step. BD columnist David Alciatore, Ph.D. - known in our online forum as "Dr. Dave' - can help with the diagnosis. On the following pages, we expound on stroke fundamentals catalogued by the doctor to help you identify the steps you might be missing or stumbling over. 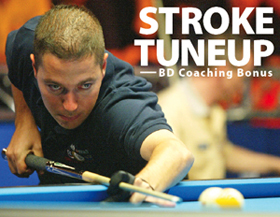 At the end is a checklist you can clip out and take to the practice room, with a drill for testing your stroke accuracy. One word of advice: One stroke won't fit all. People come in all ages, shapes and sizes, and the most effective stance, grip and practice-stroke routine for your buddy might not be the best for you or your lady friend. The key words are "comfort' and "consistency.' Find a stable, stress-free routine that works, and keep it up on every shot. It'll be easier to identify problems and make future adjustments if you have a constant regimen from the start. Find your flaws, straighten them out, ingrain your new routine, and you'll be back in the zone in no time. This is a simple equipment check. Your cue must be straight and unwarped. If you have any doubts, the bar test is always effective - rolling the cue (or just the shaft) on the slate bed. The ideal shape of your tip is between that of a nickel and a dime, depending on preference. The tip must have some texture (i.e., not too smooth), so it can hold some chalk - which must be applied on every shot). Make sure your hands and cue shaft are clean and dry. The key words are "relaxed' and "light.' A loose grip allows the hand to pivot in the pendulum-stroke motion. Holding the cue in a death-grip inhibits smooth acceleration by tightening your arm, wrist and elbow. And watch out for unconsciously squinching your grip on the forward stroke, especially when you need power. There's much debate about where in the hand to cradle the cue - in the fingers, in the palm, or in that sweet spot in between. There's no single answer. Some hands are big, some are small, some have arthritis. The important thing to grip lightly. 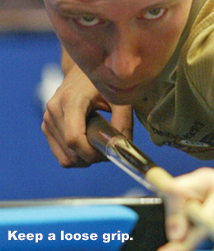 Place your grip hand on the cue so that your forearm will be perpendicular (i.e., at a 90-degree angle) to the cue when the tip strikes the cue ball. Assuming that you're using a pendulum stroke, this will ensure that the cue is moving straight forward at impact (not titling up or down) and that your tip placement on the cue ball is as accurate as possible. The key to an effective bridge is stability. Spread your fingers to plant the bridge hand on the table. Whether you use an open or closed bridge is a matter of personal preference. I use the open bridge, because I can sight the cue better, and it's easy to form a stable "V' between the thumb and forefinger. Some people prefer the looped-forefinger closed bridge, which provides multiple points of contact for guiding the cue (but can create too much friction if your hand and shaft are sweaty or dirty). There's some debate on bridge length - the distance between the bridge and cue ball. A shorter bridge (4 to 6 inches) may allow more accurate tip placement, and diminish the effects of a back hand that wanders left or right. A longer bridge (8 to 12 inches) allows you to accelerate your stroke more smoothly and build power. Six to 8 inches is good advice for most players and shots. Sight the aiming line for the shot prior to taking your stance, establish that line with your cue stick, and then step into that aiming line when assuming your stance and positioning your cue. I don't think there is one correct position for your feet. It varies from player to player, depending on comfort level. What matters is to be comfortable, well-balanced and stable, as long as the stick can come forward on the aiming line. And use a consistent stance from shot to shot. Position your head low enough to accurately read the aiming line. I like my head to be as low as possible, like snooker players. But your head and torso positions will depend on what's comfortable for you.